Hello! My name is Dave Tough. 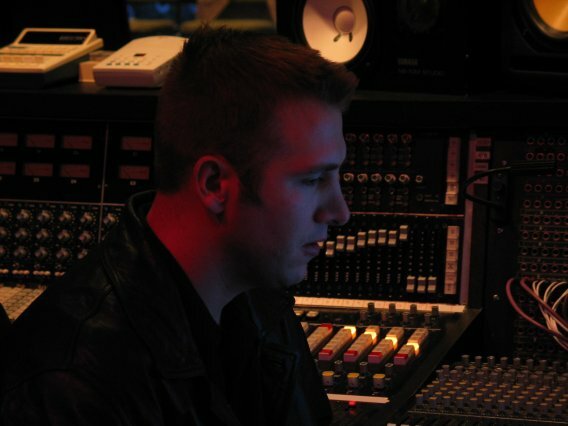 I am an award-winning producer, musician, engineer, songwriter and audio educator in Nashville, TN. After years in the music business, I still enjoy working with artists and songwriters at every level. For CURRENT NEWS and PROJECTS click HERE. As you can hear below, I love taking rough demos from songwriters over the internet and making them "radio ready". I enjoy working on masters with established artists and also developing and working with up-and-coming talent in development deals and demos. My experience as a songwriter and musican gives me the background to help other songwriters realize their artistic vision. Click below to listen to some "before" and "after" samples. Quotes and personal referrals from clients are one of the most satisfying parts of my work. "Dave, your demo of 'CLUELESS' was great... it sounds like a record that should be on the radio! Keep up the good work. I will use you again and again...."
"David, I have to let you know that I am so unbelievably amazed by what you did with my songs. I was smiling bigger than ever while listening to Sound My Gun. I was blown away. You did exactly what I imagined. A thousand times, you are amazing! Then we played the slow song. I instantly felt overcome in tears. You felt my heart and everything I wanted. Both songs are PERFECT and you are forever in my book 'special'." Love and gratitude to you! "Hi Dave! This is Larry S. I hope you remember those few cover vocals you helped me with in your home about 10 years ago. I looked back at some of my favorite moments and knocking those songs out in a quick take or two in order to reach the airport really ranks up there. Not long after meeting you, I opened for Billy Currington, held a large concert for a huge group of soldiers returning from their second tours in Iraq. Hundreds of soldiers chose us, because they had passed around those simple 6-7 cover tracks I just wanted to take a minute as i reflect and tell you how much it means to have that one passing account that has had such a lasting and strong impression on me and everyone that been a part of my music. Please stay in touch and keep me up on the new things you’re up to." Thanks again for all of your great work mixing the score. Both the director and I were very happy with it! Dave- Thank you so much for mastering my 7 track EP!! I was in tears when I first heard it! Thanks for helping my vision come to life! Would recommend you to everyone! Can't wait to work with you on future projects! Dave, hey man, thanks so much for all your great work. I'm looking forward to working with you again next spring. We hope all is well with you and your family. Once again, thanks for all you have done. You are a great guy to work with and hopefully we can work together again in the future. How are you? Good I hope? And busy I'd imagine now school is back in! I got my songs this afternoon! Thank you so so so much. They sound amazing and I know you've done a ton of work on them! Thank you for all your help in Nashville and moulding the project into three fully-fledged songs! Truly amazing and I'm so so pleased to have worked with you!! Dave-Your production of my song was absolutely beautiful. The tempo, rhythm, arrangement and vocal all contributed to the feeling I was looking for in the song. I liked the short 2 bar drum roll you put near the end of the song right after the end of the vocals. I hope you can do many future demos for me. Thank you for a job well done! "Dave, the recordings you did are great. The demo of 'Holding Hands' is getting huge accolades! A new artist in TX wants it on his album and his people say it may be title song! One record exec has heard it and already I'm talking contracts and holds. When it's my turn to 'Thank the Academy,' I'm thanking you first. You saved me from dying unsung. Hi Dave,I have been meaning to touch base with you and thank you for everything you did for Kaitlyn. You were so flexible, patient, and encouraging with Kaitlyn. It truly was a pleasure to meet you and for Kaitlyn to work with you. I have to admit, I was totally amazed at how you were able to organize the songs and complete the instrumental tracks so quickly. I realize you were thrown for a loop when we brought in two new songs that you hadn't even heard. It is crazy to think there was about a 20 minute turnaround time from when Kaitlyn, Sarah, and David finished writing the songs to you working on the instrumental tracks. Wow!! You are such a talented songwriter and producer. Thank you again for working us into your busy schedule. We both really enjoyed it and hope to be able to work with you again in the future. Best wishes for a very Merry Christmas and Happy New Year. Congratulations also on your upcoming marriage! "I work with Dave exclusively when it comes to recording my songs. His engineering skills and capabilities give my music the professional sound and quality that I want when plugging my music. A simple guitar/vocal demo suddenly sounds like an acoustic cut from an album. Dave is also an innovative producer with a golden ear for hearing those little things that give an artist his/her unique sound. He has a mental library of recordings that he draws from when mixing a song. He is critical with making sure each project has that "radio-ready" sound. Dave has an easy-going personality that is pleasant to work with and comfortable to perform around." 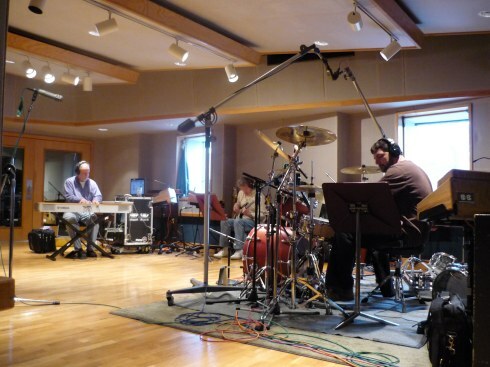 "Dave Tough's projects are superbly done with the great quality, top notch musicians and wonderful rates! Also, he is the new, top notch jingle guy!! His studio is of the absolute best quality, the sound is great, he's a great producer and his jingles are perfectly catchy. I highly recommend him." "Dave is a pleasure to work with!! No matter how many times I want to adjust the harmony vocal levels, re-EQ the snare, brighten the guitar tone or just add more cowbell, Dave does it with a smile on his face." "'I Can Do This' and 'She's Cutting Her Grass' have received great comments from a lot of Music Row's finest. They like the songs and they say the production is great--and I agree! Look forward to working with you in the future." "Thank you for the Demo! It was my first Guitar/Vocal Demo and it's great! I'm sure that I'll contact you again when I have some new songs ready for recording! Thanks a lot! Here's the feedback from my co-writer: 'Wow, I like it very much and now I'll get to work pitchin' it.'" "I listened to the demo's and WOW...I am most impressed with the melodies you've written and with the over-all demo productions themselves! You are one talented man, and I do so appreciate the hard work you've had to put into these! I'm going to get right to work pitching these songs to the artists that are waiting to hear them.... Thanks once again Dave, you've done an excellent job and you can bet that I'm going to direct any business I can your way as the opportunities arise." 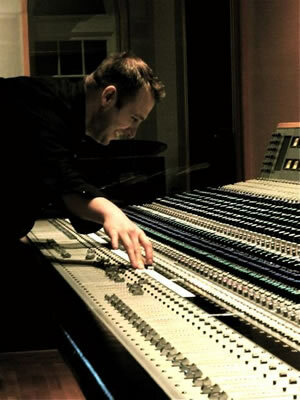 "Dave and his musicians were able to rework a track that was produced poorly into a great finished mix. His players are top notch and he puts out an amazing product for a reasonable price. I've worked with a lot of different engineers and producers and Dave Tough is among the best. He's a great talent as a musician, engineer and producer, I recommend him highly." "I just wanted to say THANK YOU very very very much for giving us the opportunity to record with you at such a wonderful studio as RCA B. You were very professional and were very helpful in getting this band started going." "Even though I live in Germany, I can still get my music recorded in Nashville. Brad Reynolds, an awesome singer and Dave did a great job on that tune. I was able to get the recorded file by ftp the next day. Thanks guys, will come back to you again !" "My Shampoo" turned out wonderfully. Your work is fabulous so I'm hoping you're available to work on my next song. "David, Rafael here, the cd sounds great! You did good work on the mixes and mastering job and the price was very reasonable." Thanks again and take care, I hope you're enjoying your Summer! Bye for now." Thank you all so very much for the great work you did on this song... It was a labor of love for Melissa and me and you have made it as special and beautiful as I envisioned. I can't wait for her to hear it... I know she will be pleased. "Hi Mr. Tough, A couple of years ago, I was looking for just the right background music for our farm-related YouTube videos. Someone told me about Pond5.com and after wading through lots of options, I found one of your songs. It was perfect, so I bought it. We’ve enjoyed it as the background music of many of our videos since then. But that’s not why I’m writing. My grandson, Tomas (his Dad is Colombian, hence the spelling), was around six months old when I first began using the clip, and even as a tiny little fellow he fell in love with it. There were times when he was fussy, and all I had to do was hold him in my lap and play the clip over and over and he would calm down, and often fall asleep smiling. Fast forward to today, and Tomas is 2.5 yrs old - but still adores the song. My sister lives 1.5 hrs away, and few days ago Tomas and I went to visit her, and we listened to nothing but your clip all the way there and all the way back. We have a little game we play every time the clip ends (I have it set to repeat): as soon as it’s over, he says “Where’s my song, PawPaw?” I start saying “Are you ready? Are you ready?” to which he replies each time “I’m ready! I’m ready!” until the song starts again, then we both say “There it is!” It’s precious. Hey - and he’s not the only one who can listen to it over and over. I love it, too. So anyway, I just wanted to thank you for helping to create memories with my grandson that both of us will cherish for years and years to come." "Dave, the song you produced for the movie turned out BEYOND my expectations, it’s just incredible. And I know it’s going to add so much more value to this film than it had before. My deepest thanks to all of you! 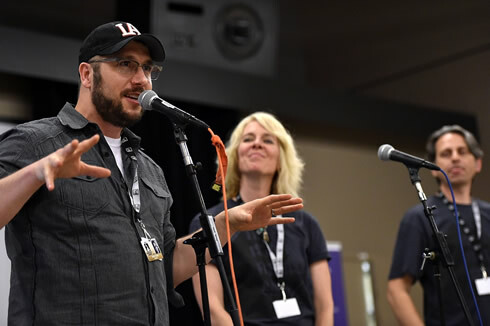 I’m hoping to generate a good buzz here at Film-Com this week for the film, just heard that we have an official direct pitch session to the executives, and we have multiple days of networking opportunities beginning tonight, so here’s to great things!" "Dave, thank you for a spectacular production and engineering yesterday... your HEART is always in everything you touch."